The Madagascar Scops Owl is a small owl with small ear-tufts. 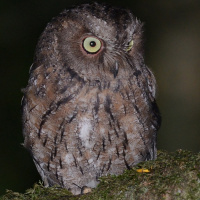 It is also know as the Malagasy Scops Owl or the Rainforest Scops Owl. A brown, grey and rufous morph are known to exist. Typical call - Andasibe-Mantadia National Park, Madagascar. November 2010. CC Charles Hesse. Description: Brown morph: The facial disc is whitish-brown with a dark brown rim. Ear tufts are small. Eyes are yellow, and the bill and cere pale greyish-brown. Upperparts and crown are pale brown, mottled with ochre and whitish markings, and with black shaft-streaks sometimes showing a 'herringbone' pattern. The scapulars have white areas, edged blackish, showing as a scapular stripe across the closed wing. Flight feathers are greyish-brown, with lighter and darker barring, more conspicuous on the primaries than on the secondaries. The tail also has lighter and darker bars. Underparts are ochre to pale greyish-brown with rusty-brown vermiculations, and blackish shaft-streaks showing a 'herringbone' pattern. Tarsi are feathered pale greyish-brown to the base of the toes, which are greyish-brown and have blackish-brown claws. Grey morph: Similar to above, but the ground colour is more greyish. Rufous morph: Similar to above, but more rusty-brown and often does not have the darker markins. Size: Length 19-22cm. Wing length 151-161mm. Tail length 74-82mm. Weight 85-116g. Females are slightly larger and heavier than males. Habits: The Madagascar Scops Owl is a nocturnal bird, roosting during the day in dense foliage, between branches or perched up against a tree trunk. Voice: The typical song is a series of 5-9 short, hollow and clear oot notes, given at about 3 notes per second, with a break of several seconds before the next series begins. 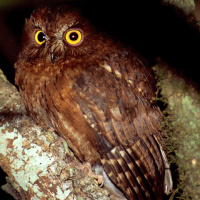 Hunting & Food: The Madagascar Scops Owl feeds on insects, especially moths and beetles. Perhaps also takes small vertebrates. Hunts by flying from tree to tree, often taking prey like moths on the wing, but also capturing prey on the ground. Breeding: Breeding biology is little known. Nesting has been observed in November and December. Nests in natural holes in trees. A typical clutch is 3-4 white eggs, which are incubated by the female. Habitat: Rainforest and humid bushy country from sea-level up to about 1800m elevation, perhaps higher. 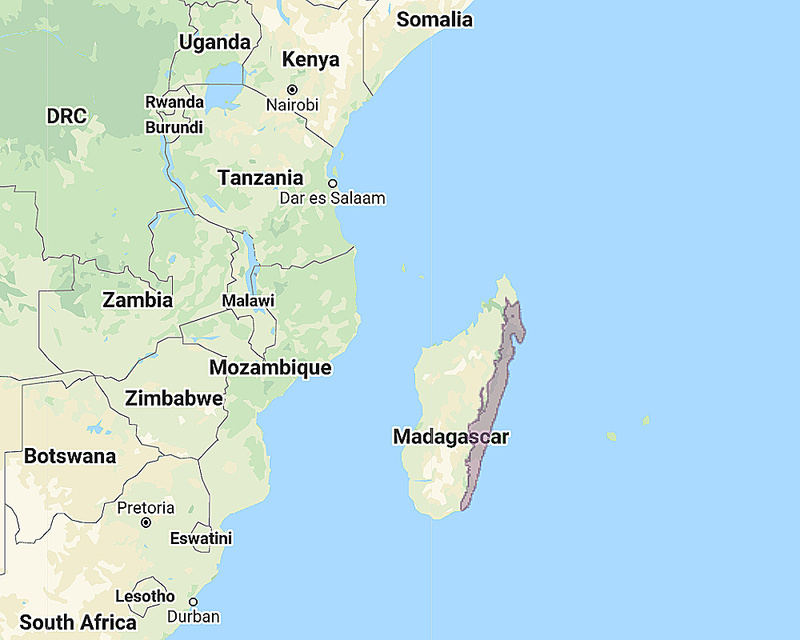 Distribution: North and east Madagascar. Original Description: Pucheran, Jacques. 1849. Revue et Magasin de Zoologie Pure et appliquée, Ser. 2 vol. 1, p. 29.